Posted on July 17, 2015 by graphics Posted in Uncategorized	. Kidding Around – In the News! Julie McDonald has penned an outdoor recreation guide for families that work, play and stay in the Columbia Valley. The self-published book titled “Kidding Around the Columbia Valley: Making the Most of Your Family Time in the Valley” was recently released and is available in stores from Fairmont to Radium. 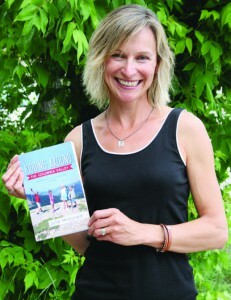 Her decision to create an all ages-oriented guidebook for the Columbia Valley was inspired by raising a young family in the area and trying to stay active in a manageable way. 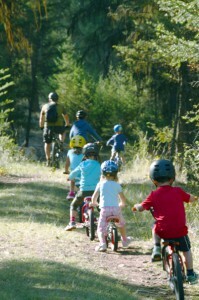 It includes recommendations for family-friendly bike rides and hikes, beach recommendations, playgrounds and sports. In addition, there is a listing of annual events taking place all over the Columbia Valley, favourite meal suggestions for families, and even childcare options. The guidebook would also be suitable for grandparents, she added. Kidding Around the Columbia Valley is now available in Fairmont at the Fairmont Mountainside Market, Smoking Waters Coffee Co. cafe and the two Fairmont Hot Springs Resort shops (poolside and in the lobby); in Invermere at Bavin Glass, Valley Foods, Crazy Soles, Rainbow Donkey Kids Clothing and Bishop’s Book Store and Coffee Lounge; and in Radium at the Radium Mountainside Market. For more information, visit www.kiddingaround.ca. Read an excerpt from our new book!